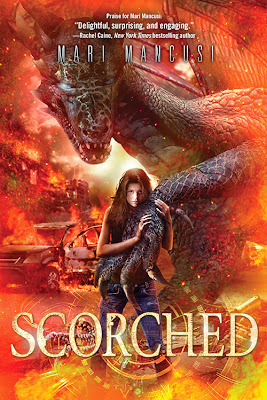 I've always been a little obsessed with dragons so of course one look at the cover of Scorched and I HAD to read it! Unfortunately, as excited as I was to read this story it didn't quite manage to live up to my expectations. It wasn't badly written but it didn't capture my attention in the way I thought it would and if I had to use one word to describe the book I'd have to say it was forgettable. It was a fairly quick and easy read that I enjoyed while I was reading it but looking back on it a couple of weeks later I just feel ambiguous about it and in spite of the many unanswered questions we were left with at the end of the book I don't think I care enough to want to pick up the sequel. Trinity has been living with her grandfather ever since the death of her mother but as much as he loves her he isn't exactly able to provide her with a stable home. He is incredibly scatterbrained and easily fooled so Trinity is the one who has had to take over the running of his museum and making sure that the bills get paid. When he comes home one day having spent all of their money on what he claims is a dragon egg Trinity is exasperated and at the end of her wits. That is until she catches a strange boy trying to steal the egg and suddenly finds herself on the run with Connor, a mysterious boy from the future, who needs her help to save the world. It's not only Connor who wants Trinity's help though, there is also his twin brother Caleb who has very different ideas about how to save the future. How can Trinity decide who to trust when both boys have such opposite views on what needs to be done? Connor has come back in time to kill Trinity and destroy the dragon egg before it can be hatched, he has good reasons to believe that would be the best outcome but once he gets to meet Trinity he begins to question his orders. On the other hand Caleb has come back to protect the dragons and to make sure Trinity is able to form a bond with the dragon Emmy when she hatches. He is part of an organisation that will do anything to make sure the dragons continue to exist even though they have destroyed most of the world in the future. Both sides are extremists and it is quite obvious to the reader that there has to be some kind of middle ground that would work out best for everyone. I quite liked Trinity in the beginning, she seemed intelligent and I expected her to use her brain and think things through. Unfortunately she has that annoying habit a lot of heroines do in that as soon as a hot guy comes along her brain gets a bit frazzled and she just goes along with whatever they tell her. I found it very hard to believe that she accepted Connor's explanation that he was from the future quite so easily and I wanted her to push for more answers from him. Then when Caleb comes along within minutes she goes from trusting Connor with her life to believing he was out to betray her and even though Caleb effectively kidnapped her she trusts him without question. It just didn't make any sense to me that she could flit between the two of them so quickly and without putting any real thought into it. On that point (I've said it before but I have to say it again) I am sick to death of love triangles and I really wish we could stop seeing so many of them in YA books! They're bad enough normally but when you make the two guys involved twin brothers that just makes me even more uncomfortable. For once I'd like to see a story where the main characters were just good friends or where there is only one hot guy vying for the girls attention. I found myself frustrated with Trinity because she went back and forth between the two of them when neither of them had really given her much reason to trust them. This is one of the few instances where I don't have a clear cut favourite out of the two boys though, they both had things about them that made me like them but they both annoyed me at times too. I don't feel invested in either outcome which is probably why it irritated me as much as it did. Scorched isn't all bad though, I really liked Emmy's character and I was very curious about the world Mari Mancusi has created. The idea of being able to visit the Nether, a separate realm where the dragons that are yet to be born or the ones who have already lived and then died can be found, was fantastic and I would have loved to have spent more time exploring it. The story moves at a relatively fast pace and did include a few interesting twists and turns that I hadn't seen coming so it definitely makes for a quick read. If you don't mind love triangles then you'll probably enjoy this one a lot more than I did. This sounds intriguing from the premise, but I also get sick of love triangles so maybe I'll give it a miss. It annoys me that so many authors waste good stories by shoving a love triangle at the centre of the book.